A Brazilian Lord of the Flies, about a group of boys who live by their wits and daring in the slums of Bahia. They call themselves 'Captains of the Sands', a gang of orphans and runaways who live by their wits and daring in the torrid slums and sleazy back alleys of Bahia. Led by fifteen-year-old 'Bullet', the band - including a crafty liar named 'Legless', the intellectual 'Professor', and the sexually precocious 'Cat' - pulls off heists and escapades against the privileged of Brazil. But when a public outcry demands the capture of the 'little criminals', the fate of these children becomes a poignant, intensely moving drama of love and freedom in a shackled land. Captains of the Sands captures the rich culture, vivid emotions, and wild landscape of Bahia with penetrating authenticity and brilliantly displays the genius of Brazil's most acclaimed author. 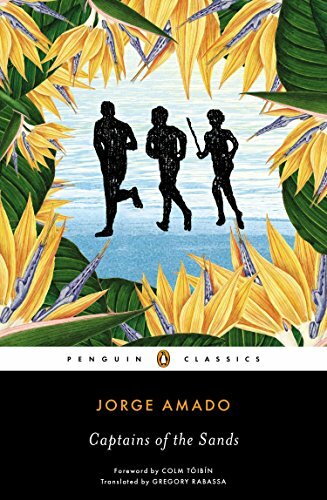 JORGE AMADO (1912-2001), the son of a cocoa planter, was born in the Brazilian state of Bahia, which he would portray in more than twenty-five novels. His first novels, published when he was still a teenager, dramatize the class struggles of workers on Bahian cocoa plantations. Amado was later exiled for his leftist politics, but his novels would always have a strong political perspective. Not until Amado returned to Brazil in the 1950s did he write his acclaimed novels Gabriela, Clove and Cinnamon and Dona Flor and Her Two Husbands (the basis for the successful film and Broadway musical of the same name), which display a lighter, more comic approach than his overtly political novels. One of the most renowned writers of the Latin American boom of the 1960s, Amado has had his work translated into more than forty-five languages. GREGORY RABASSA is a National Book Award-winning translator whose English-language versions of works by Gabriel García Márquez, Mario Vargas Llosa, Julio Cortázar, and Jorge Amado have become classics in their own right. COLM TÓIBÍN, who worked as a journalist in Latin America in the 1980s, is the author of the bestselling novels The Master, which was shortlisted for the 2004 Booker Prize, and Brooklyn.